In 2013 the history of Ukraine changed dramatically. Communities had been betrayed by state power, by their own politicians, and even their president. The overall public, humiliated in front of the entire world, whose children were shot on streets of the capital city, finally broke their silence. It was a time when divisions between Eastern and Western Ukraine disappeared, when the love for our land and truth rose above battles between religions. Ukrainian Jews, Christians, and Muslims became united with one purpose. I will never forget these difficult days and hours. I was so proud of my country, so happy that I belonged to this fight, that I was living in times of great change. When the “Revolution of Dignity” started, I was working as a journalist, and later as editor-in-chief, of an interreligious website called Spiritual Greatness of Lviv, in the city of Lviv, Ukraine, which cooperated with the Center for Interconfessional and Interreligious Dialogue at the new Libertas Center in Lviv. The choice to work in interreligious journalism was a synthesis of altruism and a deep curiosity towards, and respect for, other religious traditions. Specializing in ecumenical and interreligious spheres was interesting, but I desired more knowledge and professional education. For me, it has been always important not only to understand the Church which I belong to and other Christian denominations, but also to expand my knowledge about the world and other religions, especially Jewish-Christian-Muslim dialogue and peacebuilding processes. Such dialogue became a first step toward the independence of Ukraine. Collaboration among Christians, Jews, and Muslims for the freedom of our country saved us. Ukrainian, Russian, and European media were speechless in the face this great victory of unity, which brought brothers and sisters closer together to defend their home and achieve peace. All roads lead to Rome! After a long search, I found a perfect program to enhance my studies and interfaith work. For 10 years, the Russell Berrie Fellowship in Interreligious Studies has sponsored full-year fellowships at the John Paul II Center for Interreligious Dialogue in Rome at the Vatican’s Angelicum University. The founder and director of this unique interreligious training program at a top Catholic University is Rabbi Jack Bemporad. Graduates of this program are well-prepared to become the next generation’s leaders in compassionate and cooperative interfaith service around the world. For the past ten years, the students, professors, and alumni of the Russell Berrie Fellowship have helped build bridges of compassion, inclusion, understanding, and common respect among representatives of the Abrahamic religions. For many this represented a real turn from decades, if not generations, of misunderstanding and strife. I am grateful to have received this fellowship and studied for a year at the Angelicum. Finishing the Russell Berrie Fellowship, I came back to the Ukraine. I was so inspired by the life stories, work, and struggles of the people I met in Rome that I decided to continue my interfaith journey. I believe that my country needs young, positive, and active people who will help her become great. I feel that, before changing the world, we should take care of our Home – a place that was almost destroyed but later resurrected from ashes by the power of love and compassion. Together with the help of friends, colleagues, and volunteers, I founded the “School of Interreligious Dialogue” project. Partners in the venture were John Paul II Center for Interreligious Dialogue, The Angelicum, Institute of International Education, and Shalom Hartman Institute. It lasted for two years, 2016-2018, with the goal of connecting and building community among religions in the region. We selected 20 participants: journalists, students studying journalism, IT-workers, economists, writers, priests, psychologists, linguists, lawyers, civil servants, selected from three Abrahamic traditions – Judaism, Christianity, and Islam. 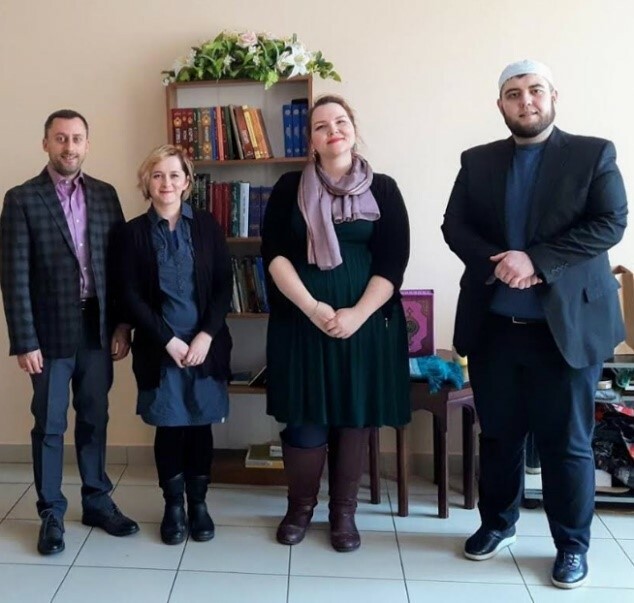 During our meetings at the School of Interreligious Dialogue we discussed problems and perspectives of religious journalism in the Ukraine and all around the world, and ways to deal with fake news and religious propaganda. We tried to find ways to use media not as religious propaganda but as a way to stop it. That was what made the School of Interreligious Dialogue so important for Ukrainian society. During these two years we demonstrated that real unity is in diversity, and promoted not only interfaith dialogue, but inclusion, compassion, and human rights, in spite of our different religious identities and traditions. We supported different religious communities in the Ukraine with conferences and round tables for Jewish, Christians, and Muslims. We visited churches of different Christian confessions, as well as a synagogue and Islamic cultural center. We worked with religious and secular media, Ukrainian Catholic University, and the Lviv City Council. Of course, we had a lot of challenges, the biggest one being building interfaith dialogue and trust in a post-Soviet country, along with learning how to respect the identity of each person, regardless of theological differences. On September 6, 2018, the School of Interreligious Dialogue received the prestigious Intercultural Achievement Award in the category “Innovation” from the Task Force “Dialogue of Cultures” of the Austrian Federal Ministry for Europe, Integration and Foreign Affairs. This initiative is one of the first steps helping to build a new Ukraine, violence-free, where people of all religions are respected and have freedom of speech. It may take a long time, but I am confident that we can implant these ideas in Ukrainian society. By working together, we can replace negative, destructive provincialism in the hearts and minds of many. To learn more about this, see our Facebook page.